I have a confession to make: when I first picked up a Star Wars lego game, it for the XBox 360, and I didn’t know anything about it. It seemed, honestly, overtly complex. I gave up on the game only after an hour or so of trying to play. It should have been easier and, I thought, more intuitive. So I quickly went back to playing GTA when the kids would go to bed. Jump ahead a year or so later, and I am looking at getting a PS3 game. 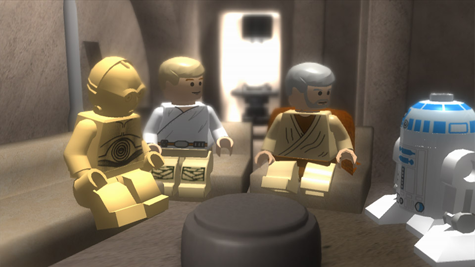 I spotted Lego Star Wars: The Complete Saga, and decided to give it another go, regardless of my previous bad experience. And it was here, playing through not just the later trilogy but the original as well, that I learned the secret to playing a Lego video game: destroy everything! The first time I had played the game, I played it like a “good guy”. I only attacked the bad guys, not the environment itself. Big, big mistake. 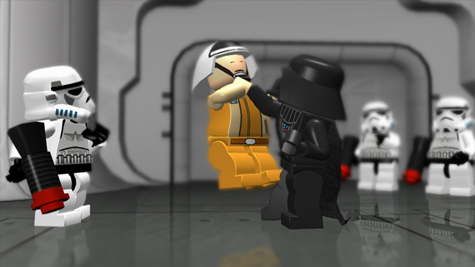 The fun in Lego Star Wars is in the breaking lego bricks, which make up the world in these Lego games. It is also essential in gameplay. In 2009 I reviewed my all-time favorite Lego game, Lego BatMan for the Mac. I gave it a perfect 5 out of 5 rating. 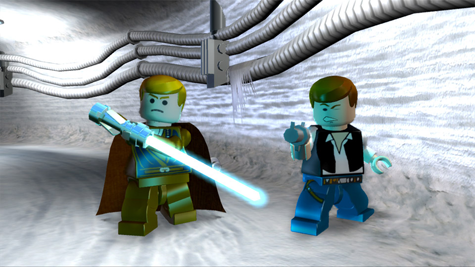 But as much as I enjoyed that game, it was the Star Wars (Lego) saga that got me into the genre, and made the Lego games (on any platform) a favorite for my family. My fear was, how well would the translation to the Macintosh work? In a word: flawlessly. The game is simple to play, yet challenging enough for both children and adults. On each level, you break things, build things, fight bad guys, and the like. For instance, on one level, you may have to build a laser gun turret, which you can only do after melting ice to uncover the hidden Lego pieces needed to build it. There are tons of hidden Logo blocks which, once found and “purchased” in the game, gives the characters new abilities, such as Fast Build (building the Logos three times or more faster) or Super Light-saber. Most levels cannot be completed 100% on the story mode of the game, having doors that can only be accessed by certain characters that are unlocked later in the game. This gives both Lego Star Wars, and all the other similar Lego games, a deployability few other games can match. It’s really the “gotta’ collect them all” mentality at work. Hey, if it works for Pokemon, it can work for Lego’s, right? 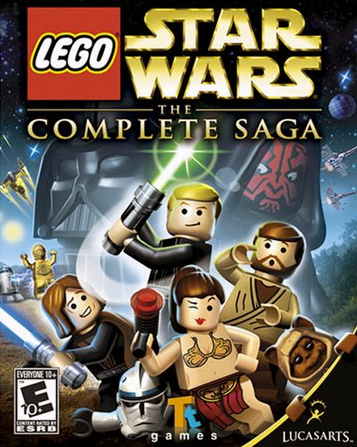 In their original release, this was two Lego Star Wars games, but were later combines and retitled “The Complete Saga”, which combines all six movies into one game. You can play characters from any of the movies on any of the levels, so you could actually have Anakin Skywalker playing along side Dark Vader on Endor, or Luke Skywalker with Yoda and R2D2 on Yavin. 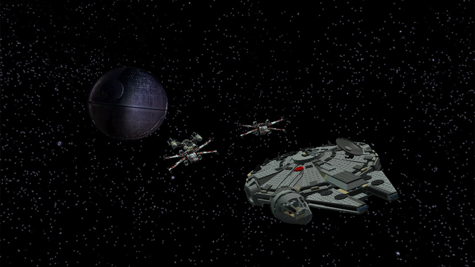 One caveat: I tried playing Lego Star Wars using nothing but a mouse and keyboard, and it was brutal. No fun at all. So I asked my Twitter followers what was the best Macintosh video game controller for the Mac, and after a lot of feedback, I took the advise of Mac Gaming God Peter Cohen and purchased the Mad Catz USB Game Controller for the Mac. Best part? Found it on Amazon.com for less than $2.00, new in the box. And, as Peter predicted, it works like a charm, no software needed to install. Using the Mac Catz Xbox 360-like controller made playing Lego Star Wars so much more enjoyable! Most of the game levels are characters ones, but there are some vehicle levels as well. While I enjoy flying the Falcon, my wife and kids insist these are the weakest parts of the game. But what would a Star Wars game be without a good space combat level? All told, this is a game I am enjoying quite a lot, which is saying something considering I have already played the game on the PS3 to near 100% completion a few years ago.